so do I modify how rsync syncs the files? The rsync should not be updating your timestamps but that "cp" command you are using will without telling it to preserve the timestamps (e.g. "cp -a"). my perl is not good enough to translate your logic into a working example. If you have time, could you help? Are the file names you are checking static? If so can you give me a list of which names you want to check for modifications? they would be static, cause I think regardless if we add swf files, the XML file is the control file and that would change, so 'playlist.xml' is the name of the file. # Which file do you want to watch? All you should have to do is set the "filename" variable to the full path of the xml file you want to watch and run the program in your user's session startup. AWESOME!! Works like a champ. Now, thanks to you, I am one step closer to replacing our windoze players with something that just works all the time, instead of nightly reboots. Need to find a way to get News, Weather, Sports, and Stocks (dynamically based on the client) and I will be golden. On a note looking ahead, is there an easy way to configure a system exactly as you want it, then package it up into an installer CD? You should be able to do a custom install using "kickstart". We do kickstart installs at work from a Red Hat Satellite server. Have you considered creating a custom live CD (or thumb drive boot) and just booting that? Yeah, I read up on that last night, and it doesnt seem that difficult. I think I am getting way ahead of myself, but as far as the player, which is the most difficult part, its done. I still have to build a content server, a database and a website to have the clients modify their content. Still a long way, but I have the approval from the higherups to proceed. More to come. Thanks for all your help. If you down and up the interface you'll have to kill off the wpa_supplicant after downing and before upping (or you could add a kill in your down script). And of course your /etc/wpa_supplicant.conf has to be configured properly. I have searched google and found other people complaining of a similar problem you refer to but didn't see an answer on a quick search. What OS are you running? I have my player with F10. I have thought about upgrading to 11 but I think I will wait for a little while. 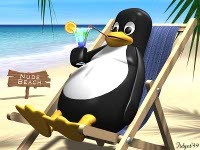 The big boss was just sold on the idea of the complete linux system, that I have been trying to convince them on, so now it is full balls out development!! Yeah!! I have been doing it like I mentioned in that last post for several releases (since before they ever included a NetworkManager).